If you like to fish saltwater in northern and Central California, you can take your pick of salmon, lingcod, halibut or sturgeon fishing at this time. Anglers fishing aboard New Easy Rider out of the Berkeley Marina and other boats have been catching around 1 to 2 fish per rod, depending on the day, outside of the Golden Gate. There appear to be two schools of kings – one at the Middle Grounds and another near S Buoy south of Seal Rocks. The fish are feeding on krill, making the flesh of the salmon particularly tasty. 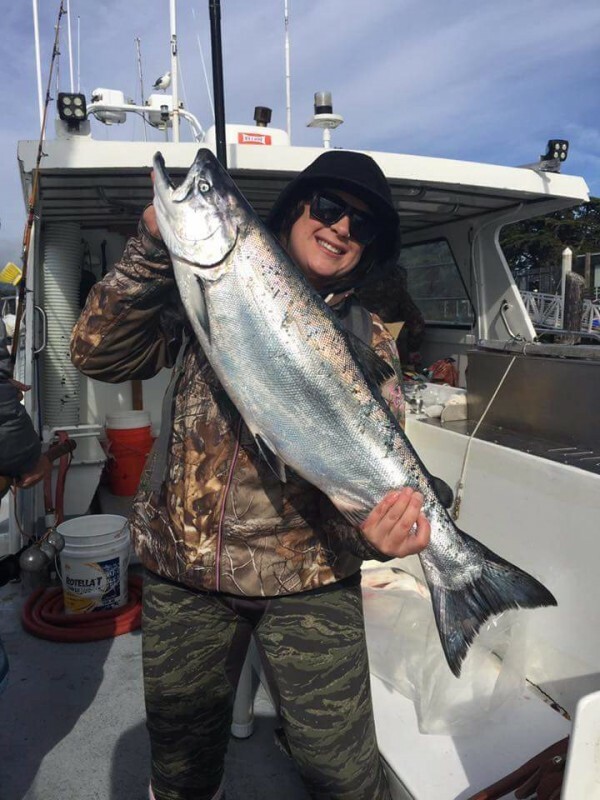 On Friday, May 26, the 15 anglers aboard the New Easy Rider landed 20 salmon to 21 pounds while trolling outside of the Golden Gate, reported Captain Joey Gallia. On the following day, the 17 passengers bagged limits of kings (34) to 25 pounds. Then on May 28, the 23 anglers aboard the boat landed 24 salmon to 22 pounds. This woman successfully battled this big Chinook salmon while trolling outside the Golden Gate with the New Easy Rider. The fishing has been boosted greatly by the spring northwest winds. While the wind has kept charter boats confined to the bay some days, it also results in food-chain boosting upwelling, bringing nutrients, krill and salmon to the surface. The lingcod and rockfish action is also great along the coast from Bodega Bay to Point Sur. On May 27, the boat checked in with lingcod limits, with at least a dozen fish going over 15 pounds and the big fish weighing in at 25 pounds. The 25 anglers landed 50 lingcod, 40 vermilion rockfish, 38 copper rockfish, 15 canary rockfish and 47 assorted copper rockfish. On the previous trip, Jones reported, “It was a beautiful day on the water with flat calm conditions. Our 21 anglers caught limits of lingcod to 19# and near limits of quality vermilion, copper and assorted rockfish plus a bonus 2 lb. petrale sole”. The passengers have been drifting live anchovies off the Berkeley Flats and Alameda for the halibut. The largest halibut caught over the past week weighed 32 pounds, while quite a few over 20 pounds have hit the deck, noted Anfinson. During a period of bigger tides, the 20 anglers boarding the Bass Tub on Saturday, May 27, landed 11 halibut to 15 pounds, 2 striped bass and 2 leopard sharks. “That was the slowest trip we’ve seen lately,” he said. Finally, anglers are seeing the top sturgeon action of the season on San Pablo Bay. 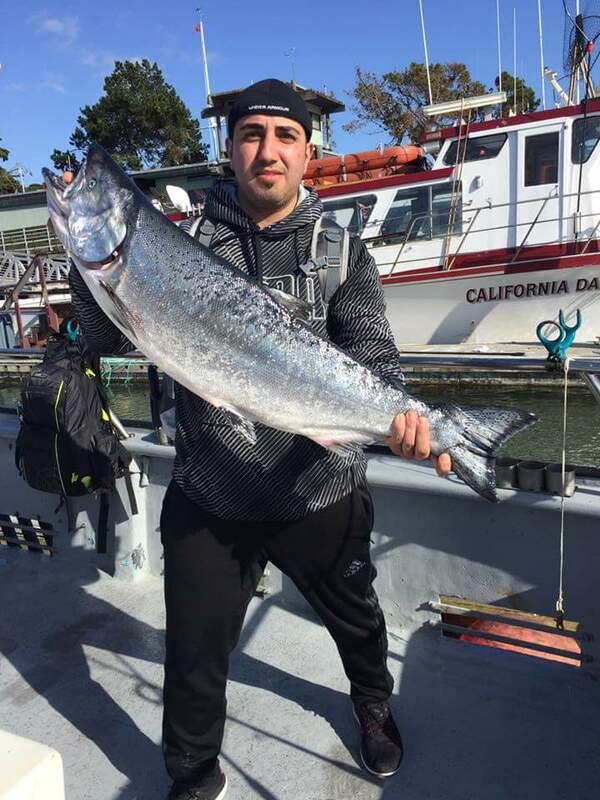 Ramil landed this hefty king salmon while trolling aboard the New Easy Rider out of the Berkeley Marina. On the latest trip aboard the Morning Star, the 15 anglers landed five keeper sturgeon measuring 43 to 57 inches long. They landed a couple of bass also, along with releasing 11 shaker sturgeon and one oversized fish over 7 feet long, according to Gordon Hough, captain of the Morning Star. The previous trip yielded excellent action also. The anglers landed 3 keeper sturgeon andn9 striped bass, noted Hough. Whether it’s salmon, lingcod and rockfish, halibut and stripers, or white sturgeon that you want to hook now, it’s a great time to go saltwater fishing in northern and Central California!